An overview of the history of progressive politics and Buddhism written by Andrej Cvercko and edited by Kris Notaro. Buddhism is one of the largest and oldest religions in the world, having been founded in approximately 500 BCE and currently possessing the third largest number of adherents of any world belief system. Over time, the fields of quantum mechanics, existentialism, phenomenology, and physics have all found parallels between their own theories and the theories of Buddhist thinkers throughout history. In addition, many concepts in the field of therapy such as a focus on the present moment and the belief that much of the turmoil human beings face originates not from external stimuli but from our own anxieties and psychological baggage were written about again and again by both Siddhartha Gautama, the historical founder of Buddhism, and those who followed in his footsteps. In addition to finding common grounds with transhumanists, scientists, philosophers, and therapists, Buddhism has long been engaged in the world of social activism. Many of those engaged in activities pertaining to environmentalism, human rights, antiwar activism, and similar activities consider themselves Buddhist or ally themselves with its philosophy. Buddhism was founded in ancient India by Siddhartha Gautama, a young prince who traditionally left his family at the age of 28 to live the life of a traveling ascetic. After years of studying Hinduism, the story goes, he meditated under a tree and achieved enlightenment. As it would take several pages to even begin to define the term enlightenment, and as its definition is not the purpose of this paper, it is enough at this juncture to say that enlightenment in this context involves and certain understanding in to the way the universe works, and humanity’s ultimate place in it. At first Siddhartha feared that no one would understand what he had just become aware of, and decided not to teach it at all. However, he ultimately came to the conclusion that others were bound to comprehend what he had learned, and that even if only a few understood it, he still had an obligation to teach. As we will see, both the feeling that other human beings will not understand and are therefore not worth the time, and that if there is a possibility for others to be helped by Buddhism that it is necessary for those following it to at least make an attempt to help, permeate Buddhist thought throughout history. Siddhartha’s philosophy was concerned on relieving suffering for humans and other forms of life, with metaphysics and beliefs in the spiritual being considered unimportant. Famously, Siddhartha once said that someone who would not follow Buddhism until they were told what happens after death, whether deities exist, etc. was similar to “a man shot with an arrow who refuses to have the arrow removed until he is told who shot the arrow, what caste the archer came from, whether they were tall or short, old or young… Such a man would surely die before the arrow was removed.” Because of its derivation from Hinduism, early Buddhism took for granted the existence of reincarnation and the Hindu pantheon, though neither is ever supported by the oldest records of what Siddhartha actually taught. Though everyone was equally capable of enlightenment, women were not given equal footing time with men. Though the way they were treated by early Buddhism was superior to their treatment in Hinduism, they were still second class members of the religion. Traditionally, Siddhartha would not even allow women to ordain and become monks until convinced by one of his students. After Siddhartha died, Buddhism evolved in to a set of schools that were later given the pejorative term “Hinayana” or “Lesser Vehicle” by their opponents, the “Mahayana” or “Greater Vehicle” schools. The only one that still exists is Theravada, or “The Teaching of the Elders”, Buddhism. The aforementioned Buddhist Global Relief, which is primarily concerned with helping victims of natural disasters, and the Mind Body Awareness Project, a California group which attempts to use Buddhist meditation techniques and modern therapy to help recovering drug addicts, are affiliated with Theravada, and as a school it is predominantly present in Sri Lanka, Thailand, and Malaysia. Additionally, the early schools were very concerned with renunciation of the world and of its ways. The world as it appears was considered transitory and illusory, and the primary concern was to achieve enlightenment or a good situation in an adherent’s next life. This created a general view being concerned with social injustice or improving the condition of living on Earth was considered at best a waste of time and at worst a distraction from tasks that actually mattered. Though the early schools kept the focus away from metaphysical theorizing, they moved from the individualism and equality of “be lamps unto yourselves” to a sense that only ordained monks could attain enlightenment, and that the laity’s role was to support them and in doing this be reborn in their next life as someone with the type of mindset to be ordained. Monks went through the streets every day begging, and in return ran schools and gave lectures on Buddhism. In many southeastern Asian nations, Buddhist monks are still the primary teachers of young children. The early schools of Buddhism, while engaged in social services such as education and in generally peaceful and progressive beliefs, was in general too renunciatory to on any large scale engage in social activism on the part of the monks, and relegated the laity to the position of simply praying and giving monks donations, as these were viewed as the practices most beneficial to a layperson. Some Buddhists recognized this and, taking matters in to their own hands, created the foundations of the Mahayana schools. The Mahayana schools of Buddhism appeared sometime around the first century BCE. They include every form of Buddhism that is not Theravada (such as Zen, Nichiren, Pure Land, Shin, and Tantric Buddhism to give a small set of examples) and are currently predominantly present in central Asia. 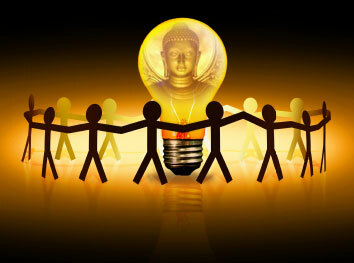 The Mahayana schools began when new scriptures purporting to be the words of Siddhartha began circulating. These works are today recognized as not being spoken by Siddhartha, but by later Buddhists. Despite this, Mahayana Buddhists around the world hold that since what these scriptures, or Sutras, say rings true, it does not matter who originally wrote or said them and continue to study, recite and follow what they contain. The major difference between the Sutras and the earlier Suttas, is the concept of the Bodhisattva. The Sutras hold that, out of compassion, some who are on the verge of enlightenment hold off on becoming full-fledged Buddhas because the rest of the life on Earth is still suffering. These people, who are known as Bodhisattvas, vow to not become enlightened until every sentient being can become enlightened with them. The Bodhisattvas are treated as spiritually powerful entities, who constantly reincarnate and guide their fellow humans towards enlightenment. The Sutras also describe Buddhas other than Siddhartha. These other Buddhas are enlightened men and women from the Earth’s past, or from other planes of existence or other planets. These new Buddhas, and Siddhartha himself, are also elevated to a god-like status and held up as beings to pray to and worship. The addition of Bodhisattvas to Buddhist thought gave power back to the laity. Though many Bodhisattvas were monks in their previous lives, others reached their state while still being “house-holders”, men and women who lived normal lives and had families. Enlightenment was once again open to everyone. Furthermore, the ideal of holding off full enlightenment until the rest of life was ready to enter that state with you invigorated practitioners into a sense of compassion that the earlier schools only wrote of as a nice thing to try to do. The pre-Mahayana schools were given their “lesser” status and some of the Sutras had Siddhartha disparaging the Hinayana schools as being for the “weak minded” and the “selfish”. Mahayana brought a good deal of changes to Buddhism, some good and some less so. The new, god-like Bodhisattvas and Buddhas caused many to decide that this world was not worth worrying about at all since if they prayed hard enough, they would be reborn in paradises. In particular, Pure Land Buddhism, historically and currently one of the most popular Buddhist sects throughout Asia, focused on the Buddha Amitabha, a Buddha from the Larger Sutra of Immeasurable Life who created a heavenly dimension known as the Pure Land which a practitioner is guaranteed entry in to in their next lifetime, so long as they have faith in Amitabha. This had the two effects: it allowed members of society who previously could not be Buddhists in good standing, such as soldiers, prostitutes, and butchers a sect which they could belong to, and at the same time caused many to decide that it didn’t matter how they acted when they were alive since Amitabha was going to save them regardless (famously, a group of Pure Land Buddhists became assassins in medieval China, setting out to prove the greatness of Amitabha by making their livings as killers and still hoping to enter the Pure Land). This focus on the supernatural moved Buddhism away from its roots and, over time, lay people once again began for the most part to simply pray and to give donations to wandering monks. Some sects, such as Zen Buddhism, tried to move back to a more phenomenological ground. Zen was founded around 520 CE by Bodhidharma, a monk who traveled from India to China to teach a stripped down version of Buddhism. To Bodhidharma, praying to Bodhisattvas and giving donations to monks did not result in enlightenment. Meditating and living a good life were the paths he preached. Helping the poor was not something to be done so that one would be reborn in a rich family, it was something one should do because then the poor were helped and this made the world a little better. Hui-Neng, the sixth patriarch of Zen (638-713 CE), came from a less-than-ideal background. He was ethnically Lao, a minority in ancient China that was considered intellectually inferior to the predominant Han ethnicity. In addition, his father had been banished from the Imperial court, and Hui-Neng was raised in a rural mountain town, cutting firewood for a living and never learning how to read or write. In the one document based on his teachings (and the one Sutra that was never claimed to have been spoken by Siddhartha), Hui-Neng tells an audience this, and how despite being an illiterate from an ethnicity that most Chinese citizens looked down on, he achieved enlightenment because “Men know North and South, but the Dharma (teachings) does not.” He also explains that, if people want, this world can be the Pure Land and, if it was, would be a more reachable one than that promised by Amitabha (“Ordinary, ignorant people, not realizing their own essential nature, do not recognize the Pure Land in their own bodies.”). Despite all this, Zen was primarily practiced by monastics historically, and was once again more concerned with renouncing the world rather than attempting to improve it. It is not until the beginning of the 20th century that sects of Buddhism become chiefly concerned with social activism. An early step in this direction was the work of a Zen monk in China named Taixu or “Great Emptiness” (birth name: L? Pèilín ) Taixu wrote about what he called “Humanistic Buddhism”, which he contrasted with Buddhism that was primarily concerned with ghosts, reincarnation, and the supernatural. One of his students, Hsing Yun (“Nebula”) has written many pamphlets on Humanistic Buddhism and still teaches about it to this day. As Buddhism moved in to the 20th century, it adapted fairly well to the advances that history brought. Though Japanese Buddhists supported the Axis powers in World War II, they have since apologized publicly whenever the issue is brought up and have made few attempts to hide what happened. Buddhist leaders such as the Dalai Lama and Gudo Nishijima (the head of the largest Zen monastery in Japan) fully support advances in physics and biology, admitting when these sciences contradict their scriptures that the scientists are in all likelihood right, and writing extensively on the connections between science and Buddhism. Socially conscious Buddhism, or “Engaged Buddhism” is a byproduct of this modernism and the Humanistic Buddhism of Taixu. Engaged Buddhism, also known as Socially Engaged Buddhism, works to apply the pacifism, equity, compassion, and focus on community that Buddhism is clasically associated with on a global scale. Some argue that it is Buddhism mixed with the Protestant Christian work ethic, though others feel that it is simply the natural evolution of what Siddhartha Gautama taught 2,500 years ago. Thich Nhat Hanh (“Being in Touch With Here and Now”), a Zen Monk from Viet Nam, has spent most of his life working towards teaching pacifism throughout the world, and was nominated by Dr. Martin Luther King Jr. for the Nobel Peace Prize in 1967. He founded a separate sect of Buddhism, the Order of Interbeing, in the 1960s which is devoted to social equity, environmental protection, and helping the victims of war. He even rewrote the Buddhist Precepts, the closest Buddhists have to a “Ten Commandments”, to be more in touch with the issues we are presented with in the modern world. Noah Levine is another modern Buddhist who has worked in the general school of Engaged Buddhism. He is a former crack addict and juvenile delinquent who now is the primary spiritual teacher of the “Dharma Punx” sangha. Levine, through his books Dharma Punx and Against the Stream: A Buddhist Manual for Spiritual Revolutionaries and through his work traveling to prisons, juvenile halls, and Buddhist temples, has tried to introduce a form of Buddhism that he hopes can reach at-risk youth, a position that someday should play a part in technoprogressivist philosophy. His friend, and another recovering addict, Vinnie Ferarro, heads the Mind Body Awareness Project which the two founded together. "[Buddhism] is an epistemological philosophy and an intrapersonal approach to perception, self-awareness and self-regulation. It’s an aesthetic. It’s a non-anthropocentric ethical viewpoint that places an emphasis on meaningful, compassionate and genuine relationships. It’s a type of Humanism. It encourages meditation and a mindful approach to living. It’s a worldview and methodology that promotes skepticism, rationality, empiricism and even non-conformity. It is the practical acknowledgment of the unavoidable perceptual subjectivity that is part of the human condition. It is the recognition that the mind matters and that conscious awareness can and should be optimized." Since its inception Buddhism has changed a great deal. However, throughout its history, it has always been concerned with improving the lives of those it encounters. Much of the time, it did not even require one to convert to Buddhism for Buddhists to attempt to help, and its strong lack of dogmatism has helped it adapt to the needs of modern society. Whether the coming years will see Buddhists work more towards establishing a Pure Land here and now, or whether they will see a retreat once again to monasteries and to attempting to avoid the world’s problems, it is clear that the history of social activism in Buddhism is a long and checkered one, and a history which will have new chapters added to it, for example its impact on transhumanism as the “religion” continues to influence sentient beings whether they are human or cyborg. Kris Notaro works with the Bertrand Russell A/V Project at Central Connecticut State University, producing DVDs to be used in the classroom. His major passions are in the technological advances in the areas of neuroscience, consciousness, brain, and mind.